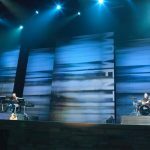 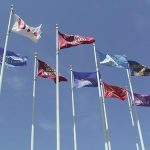 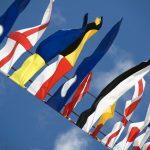 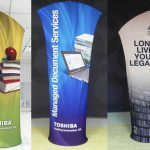 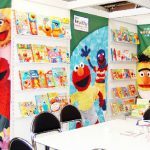 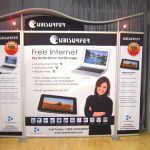 When your message needs to be front and centre at an expo or trade show, you have to make sure that the trade show stand you use is set up so that all eyes are drawn to your message when people pass by your booth. 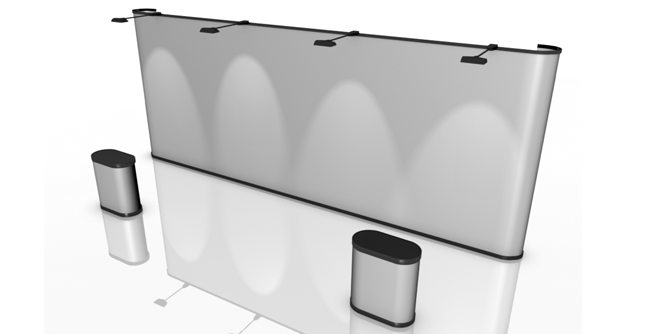 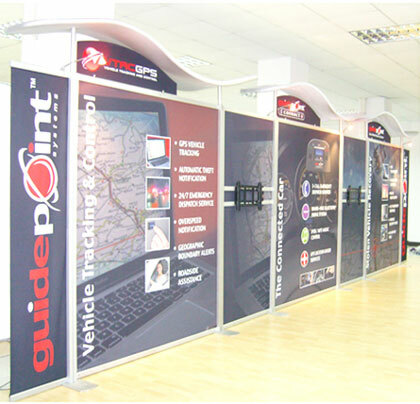 A centralised display is key to your booth’s design, and our 20-foot gullwing pop-up stand is the right tool for this purpose. 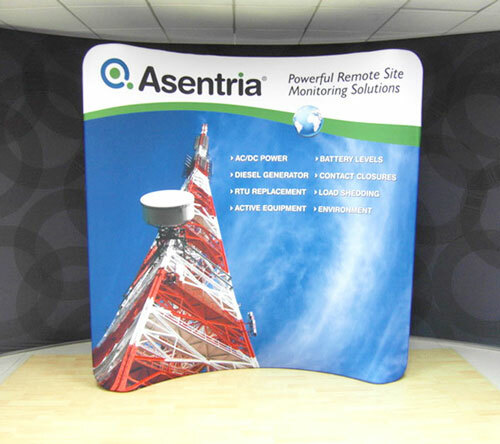 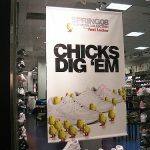 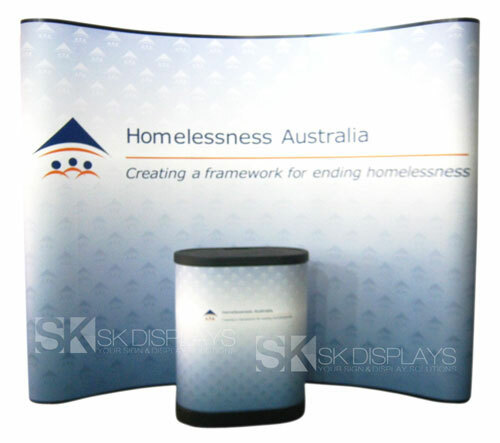 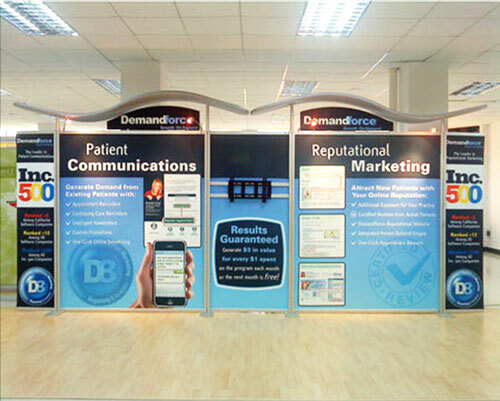 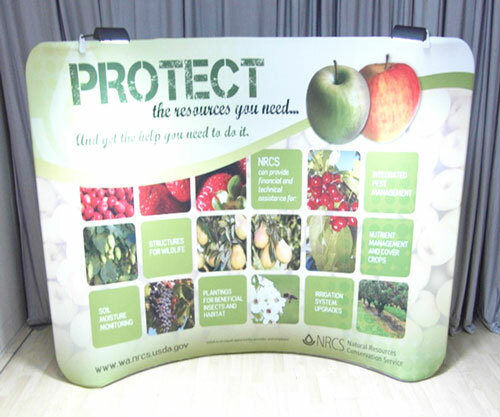 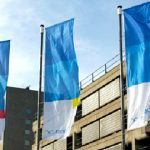 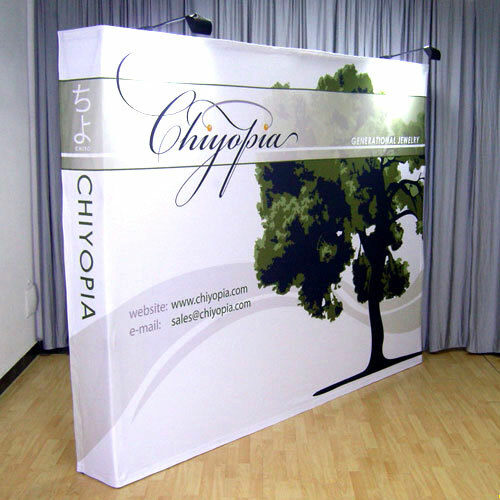 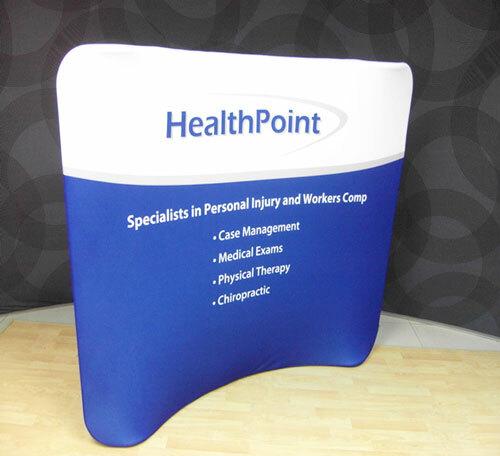 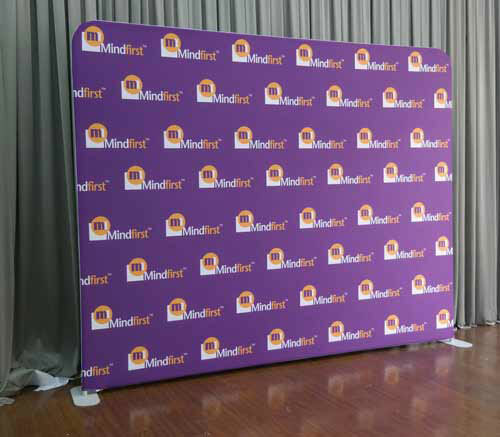 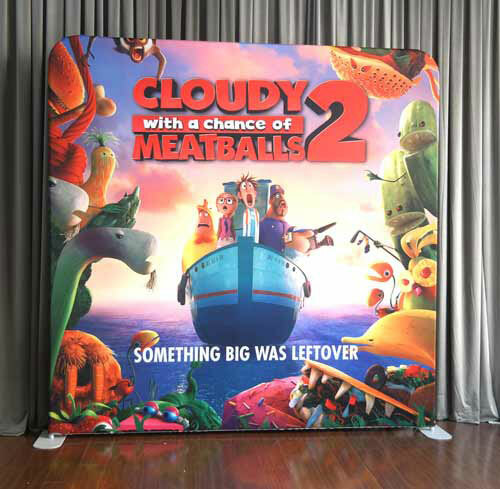 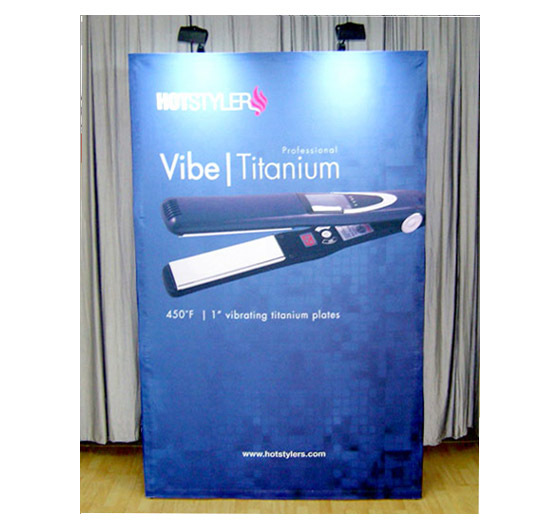 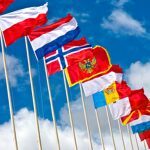 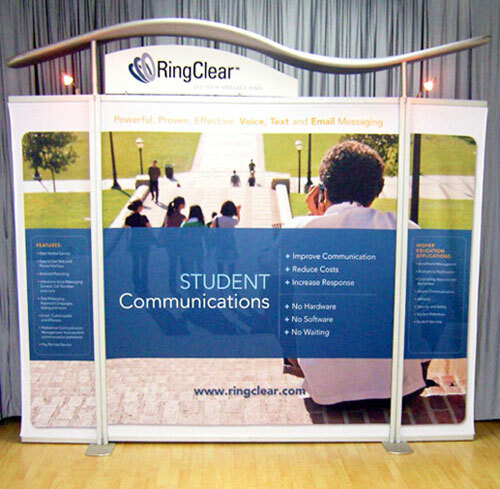 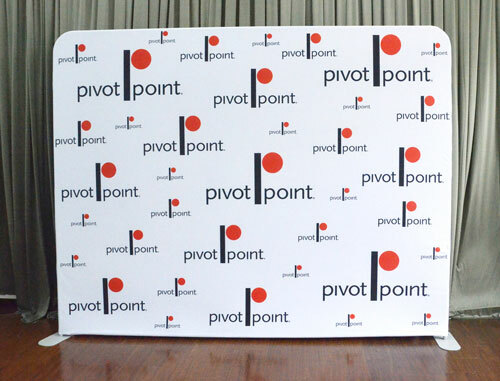 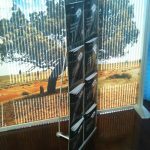 Our 20ft gullwing pop up display has the ideal shape for showcasing an important message. 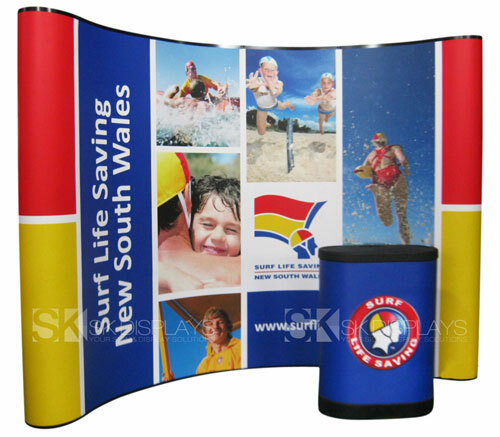 It has a curved centre frame flanked on each side by a smaller straight frame. 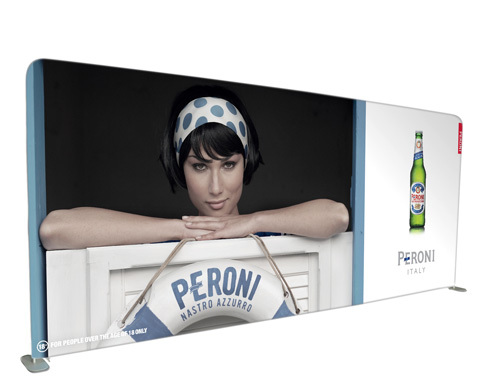 These frames are made of aluminium and covered by a set of ten full-colour and high-quality graphic panels. 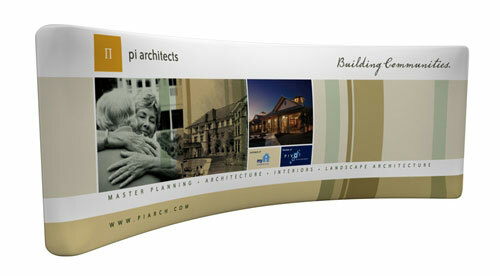 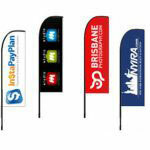 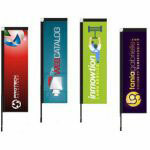 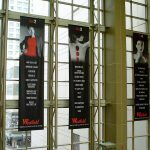 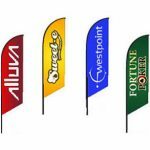 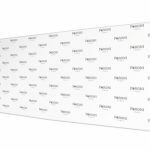 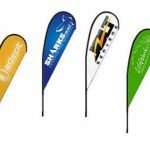 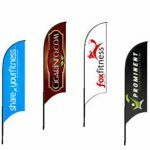 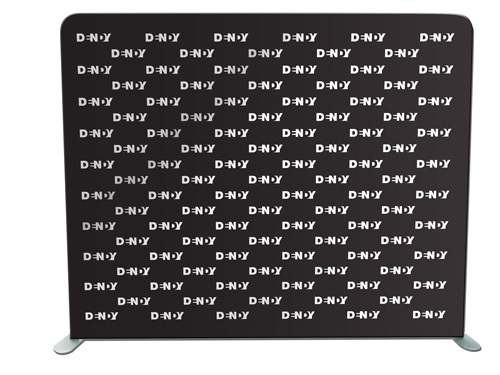 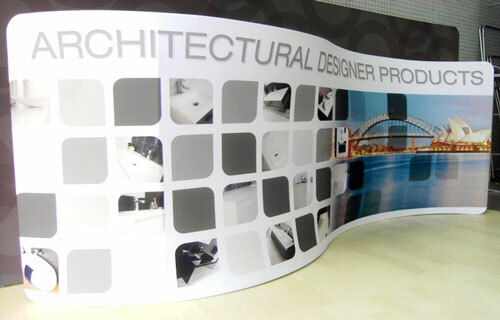 You can choose between panels made with fabric and with laminated PVC. 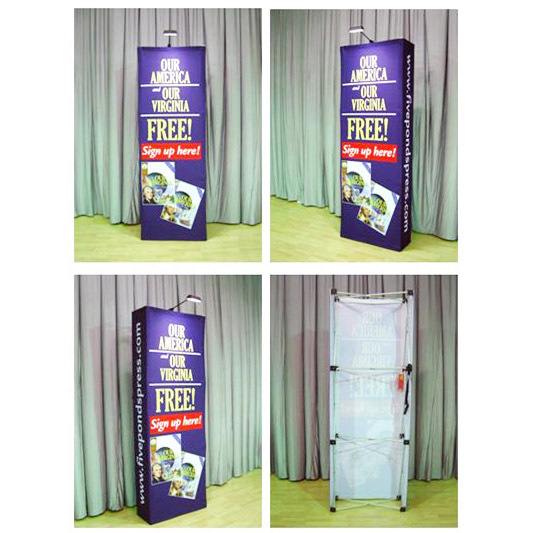 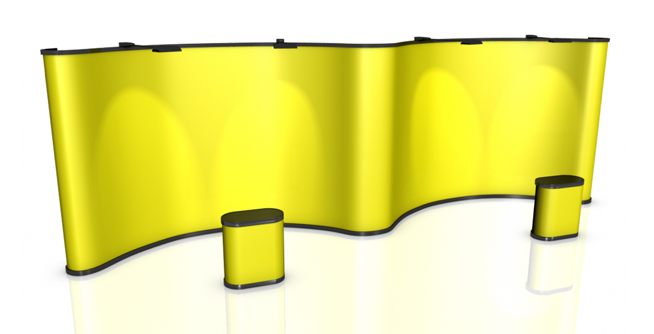 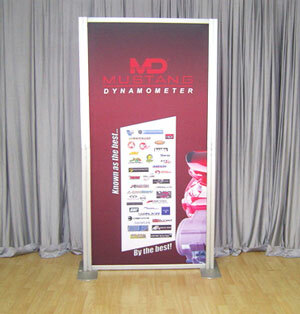 The dimensions of this gullwing pop-up display are: 6100mm/W x 1000mm/D x 2310mm/H. 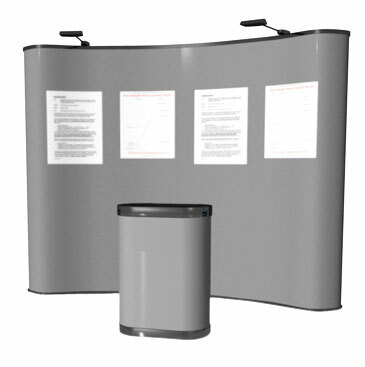 We also make custom built exhibition stands, so if you want a specific height for this particular display, we can accommodate your request. 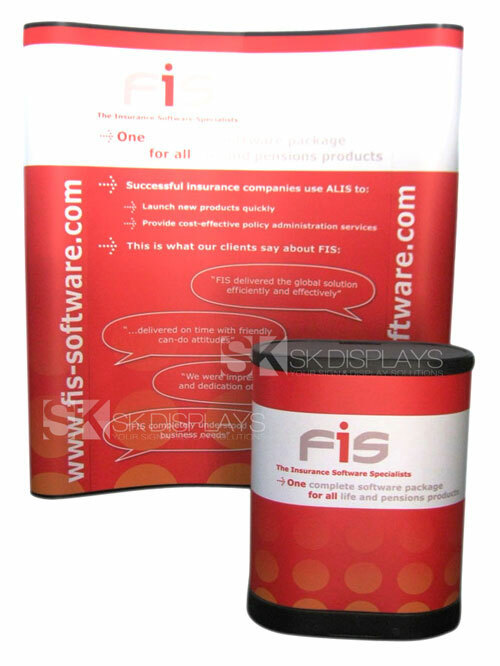 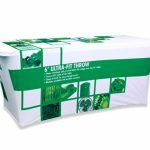 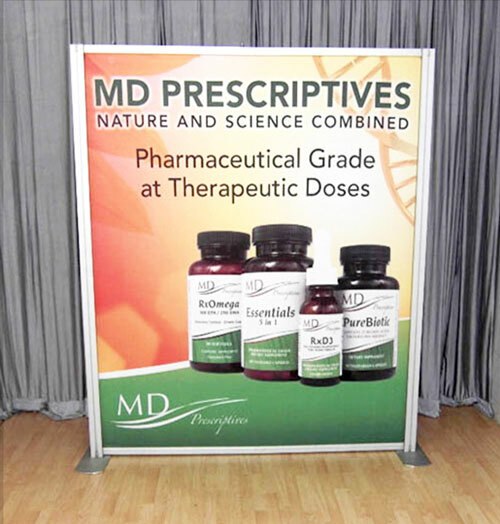 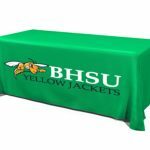 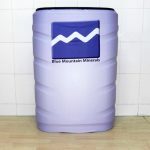 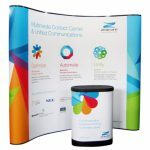 This display package comes with three wheeled carrying cases, making the display portable and easy to store. 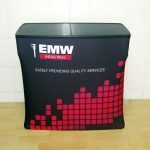 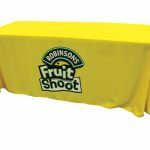 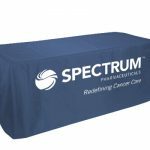 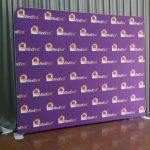 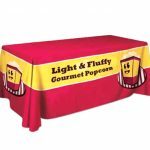 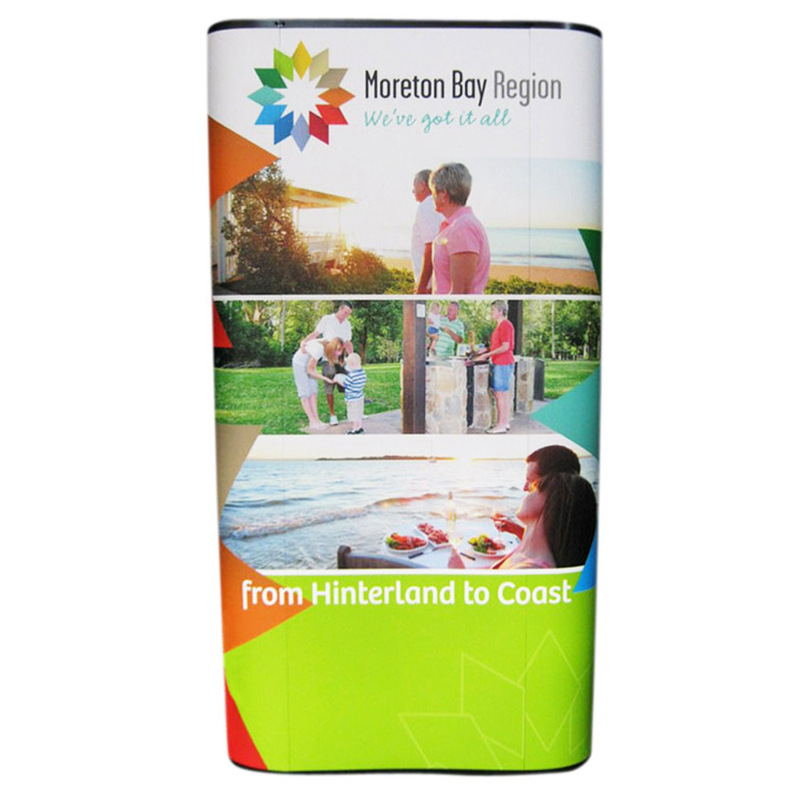 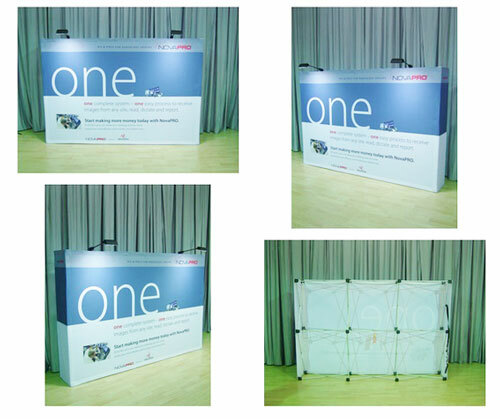 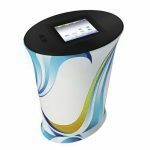 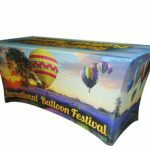 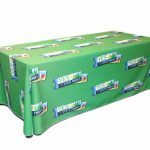 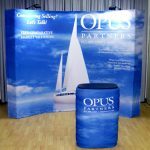 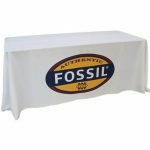 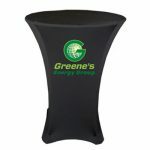 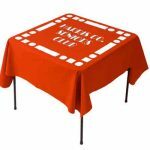 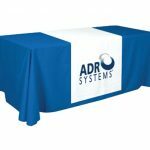 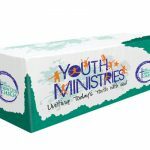 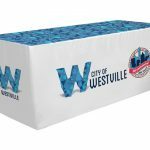 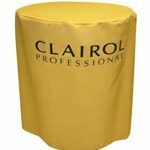 With graphic or fabric wraps and wooden tabletops, these carrying cases can double as counters at your exhibition stand. 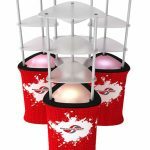 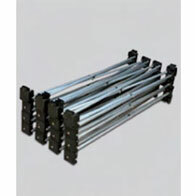 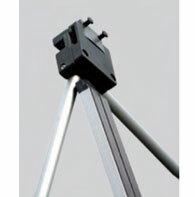 The package also includes six halogen lights to serve as spotlights for your display. 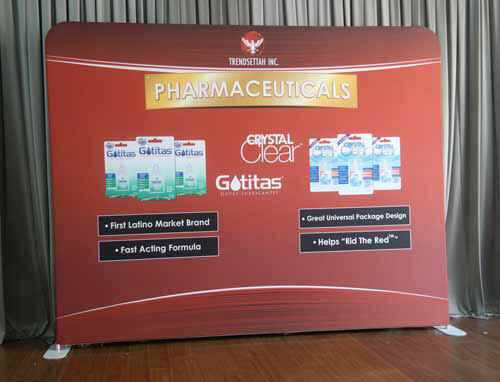 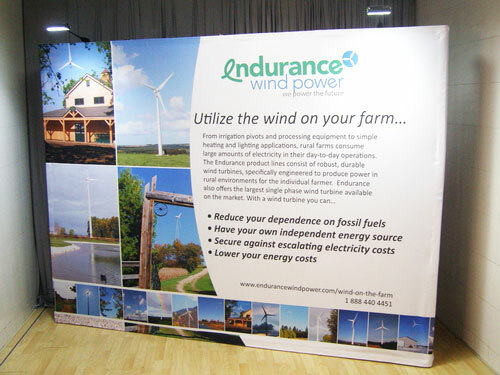 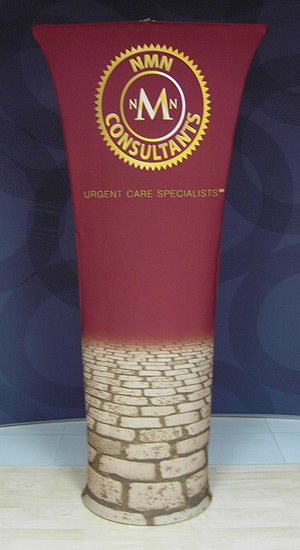 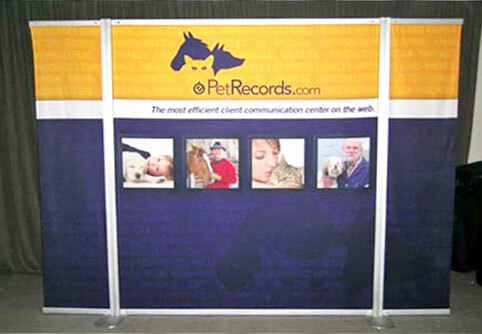 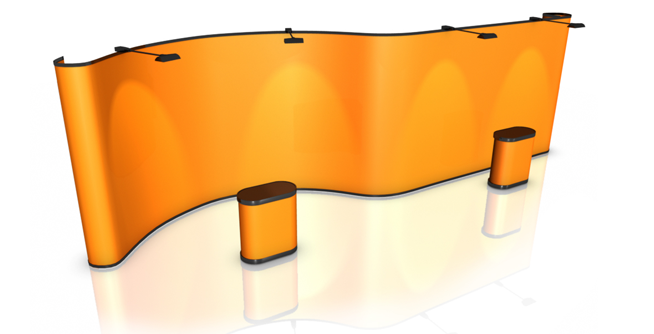 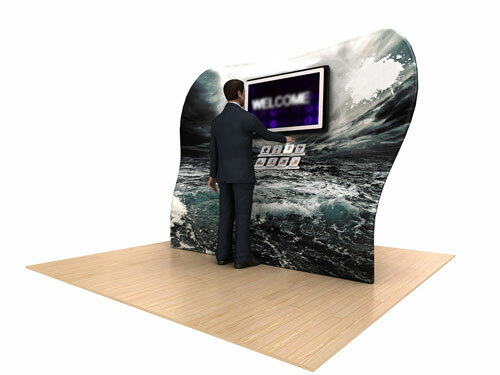 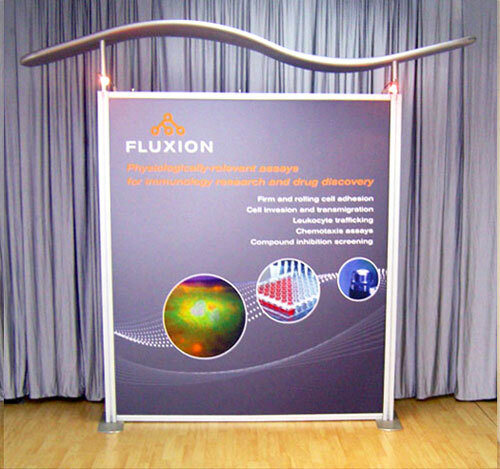 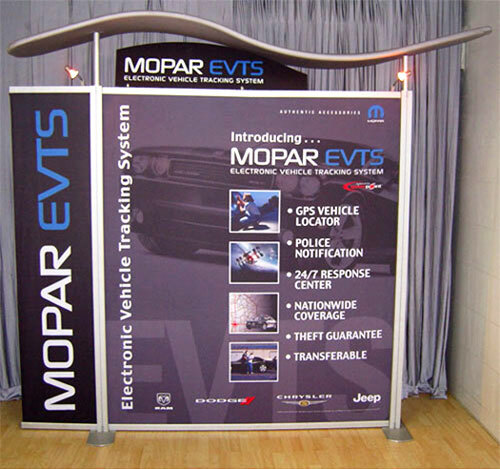 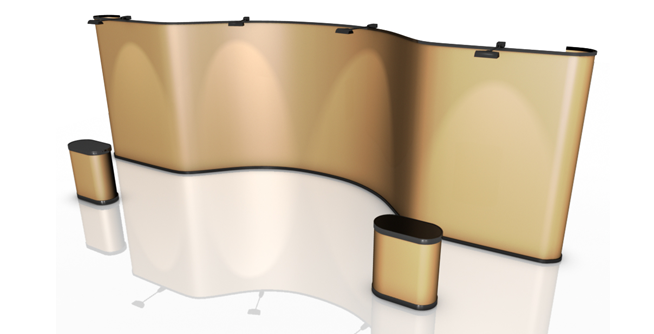 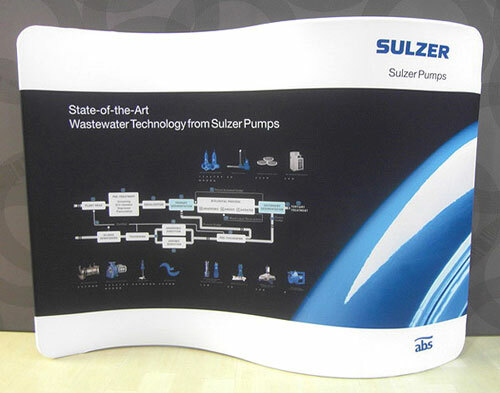 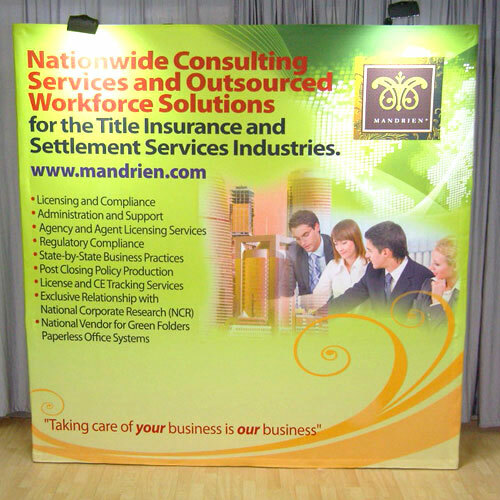 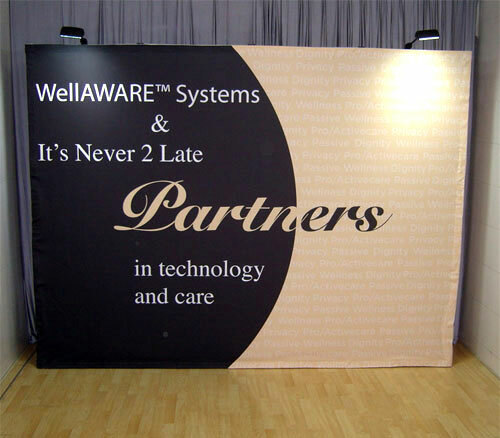 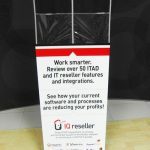 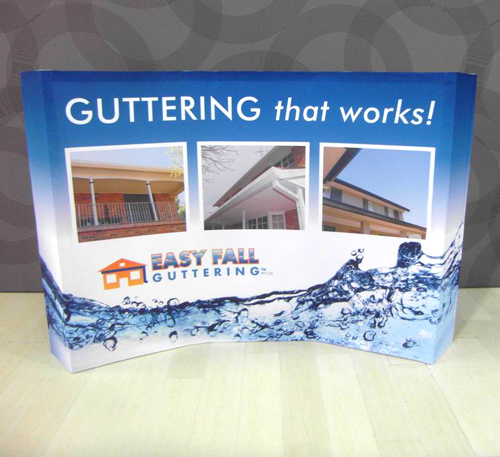 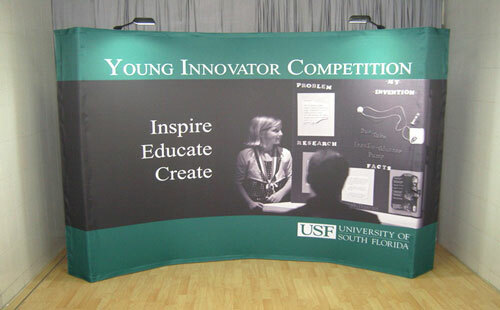 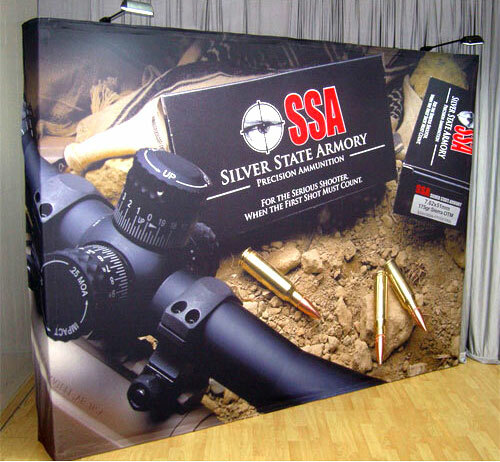 One of the main attributes of our gullwing pop-up display is you are not limited to using it at trade shows or expos. 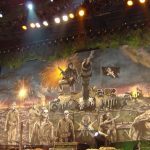 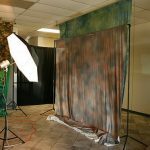 You can also use it as background for red carpet events, press conferences, corporate parties, theatre displays, award ceremonies, school formals, weddings, and other such shindigs. 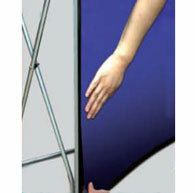 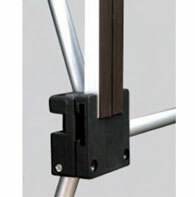 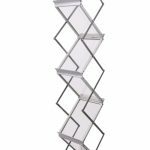 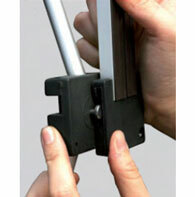 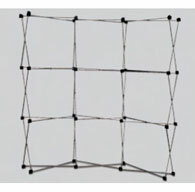 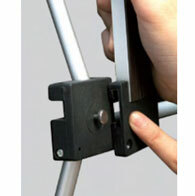 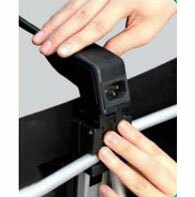 Moreover, you can break up this display into two or three smaller parts. 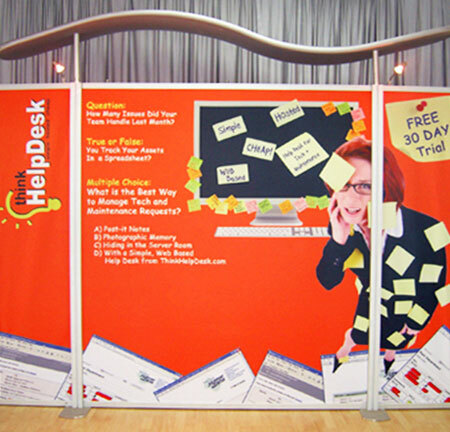 This allows you to be more flexible when available space becomes an issue during the setup. 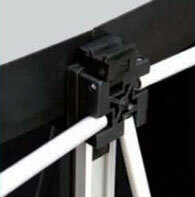 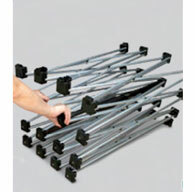 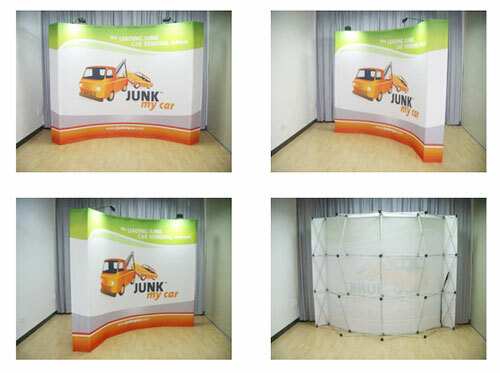 Speaking of 20ft pop up display setups, this display is very easy to assemble. 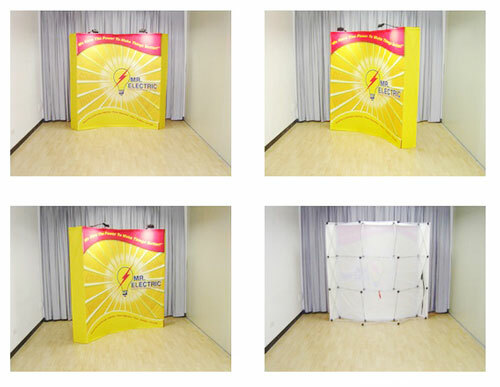 All you have to do is to pop up the frames to their entire width and height. 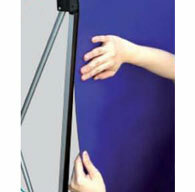 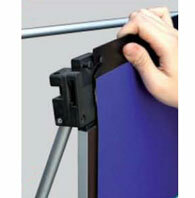 Afterwards, you attach the graphic panels with the help of the Velcro strips on the panels and the frames. 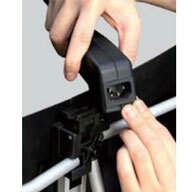 The entire process is simple and takes only 20 minutes to complete. 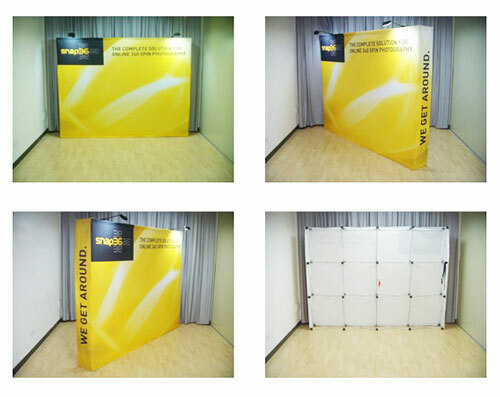 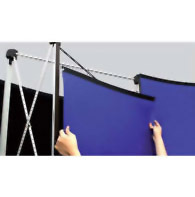 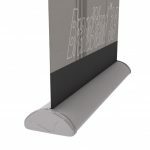 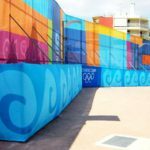 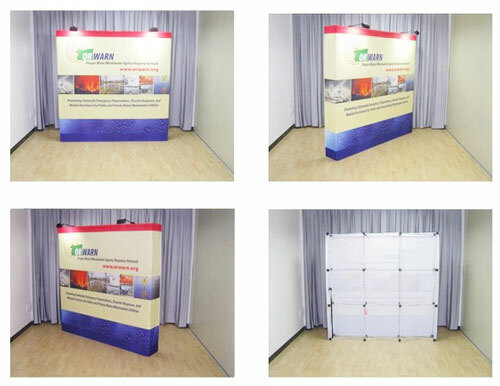 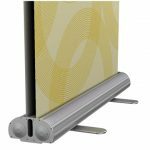 Because this gullwing pop-up wall can be separated into two or three smaller display walls, purchasing this package is like buying four displays for the price of one. 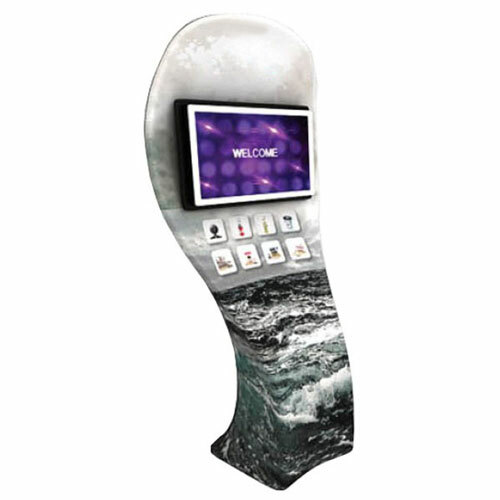 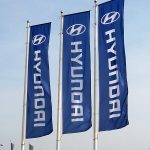 That alone is enough to generate savings on your display needs. 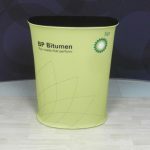 Add to that the fact that these displays are entirely reusable. 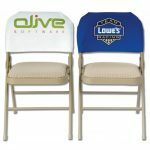 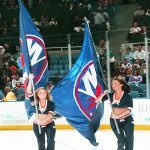 You can set them up at different events for as long as you want them. 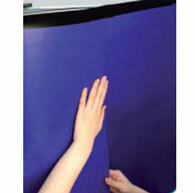 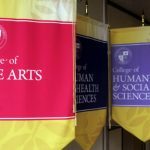 If you need different graphics, all you have to do is order new panels. 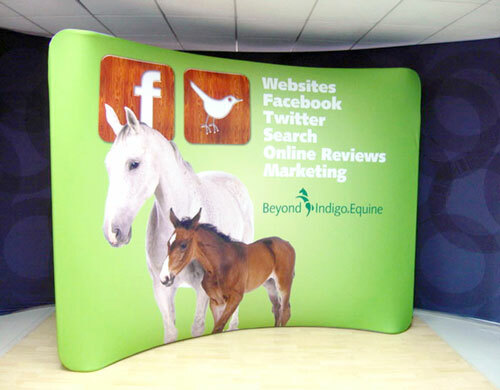 Our 20ft gullwing pop-up wall is indeed the best trade show stand you’ll ever find in the market today. 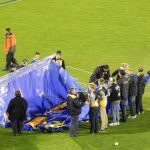 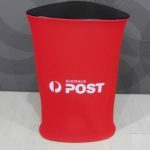 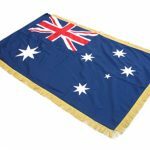 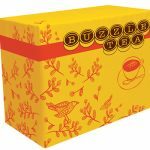 We deliver to any location in Australia, including Melbourne, Sydney, Canberra, Gold Coast, Adelaide, Perth, Darwin and Brisbane. 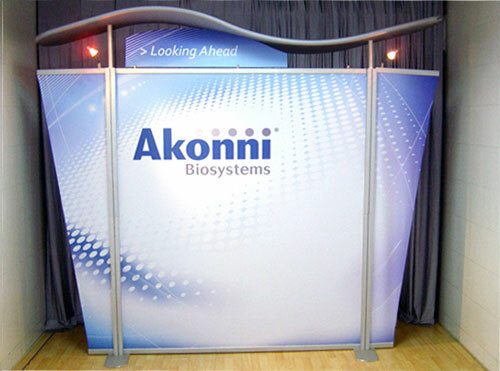 Call us right now to learn more about how our products can serve your needs.